See also a Lucky Strike ad from 1933 and an Old Dutch Cleanser ad from the 1920s. See a Modess pad ad from 1928 - Compare the American "Modess . . . . because" ads, the French Modess, and the German "Freedom" (Kimberly-Clark) for teens. San-Nap-Pak menstrual pad ad, 1932, U.S.A. This San-Nap-Pak menstrual pad advertisement from 1932 (U.S.A.) claims medical endorsement, just as Tampax, Kotex, o.b. tampon, and many other companies did and still do. 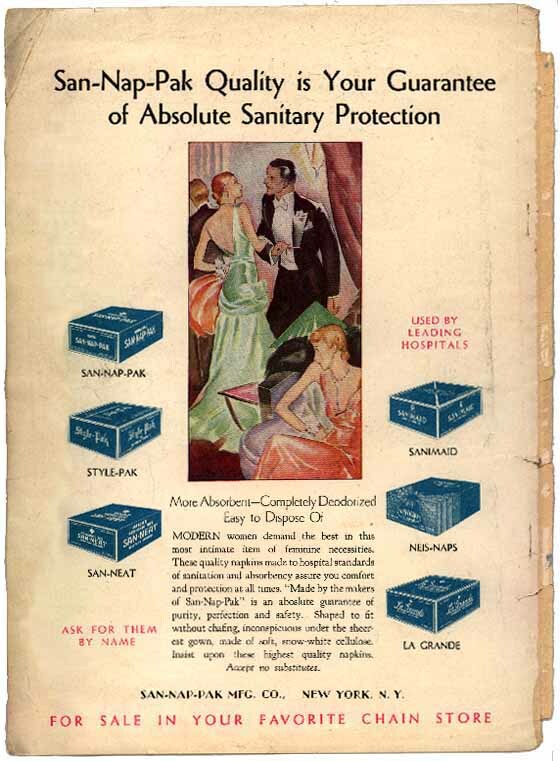 In the 1930s, the American Medical Association asked Tampax to stop putting "Accepted for advertising by the American Medical Association" on its boxes and in its advertising because it seemed to imply its approval. Doctors wielded their authority in this era more than they do today. Calling one style of its pad La Grande - I assume the biggest - reduces the embarrassment women might have felt by ordering the big size; Americans use French for naughtiness or haughtiness, a strange combination, but then Americans find the French hard to understand - especially when they speak French, and fast. (See a French ad for Modess.) Better to throw the blame for sexiness on the worldly French than accept our own feelings. The ad further claims the high ground, as opposed to the low ground of menstruation, by showing richly dressed people, right from a movie. Beneath the ad we see the cover of the magazine in which it appears (the ad appears on the other side). 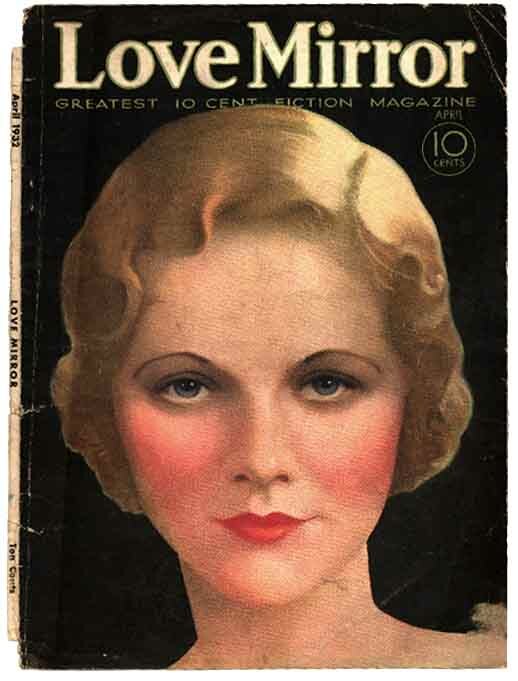 I couldn't resist showing this example of 30s cover art from America, when the paint brush and airbrush ruled illustration in magazines, and editors didn't deface magazines with lists of content. The New Yorker magazine is the only survivor today of this style, a sight, and a site, for sore eyes. See a San-Nap-Pak ad from 1945 in American Girl, and a box of San-Nap-Pak tampons.